More than a few gamblers, who enjoy head-to-head poker in private games or in poker rooms at casinos, have never even considered playing on the Internet. It appears that a couple of major misconceptions have scared them away from online poker games. The first, a common misconception about all Internet-based gambling, is that head-to-head online Texas Hold’em or stud games are somehow rigged so that the bettors give their money to the casinos hand over first. You can show them scores of reputable online poker sites with strict regulations in place to prevent this kind of abuse, and rather than this information putting their fears to bed, it sometimes stokes the fire of their insistence that online gambling is fixed to even greater heights. It has been suggested that the tight-knit nature of online poker fandom (where the most active players at a given site all seem to know one another) exists as a kind of stop-gap for controversy. In other words, if a site does start to behave against type and try to rip their customers off, it garners attention in no time. Poker rooms in casinos don’t have this feature; because Internet poker players are such a tight-knit group, games at sites with this kind of community could actually be said to be safer than those at the more anonymous poker rooms. But besides the whole “Internet gambling is fixed” thing, the other major misconception is that Internet poker games are all video poker. Of course, this is ridiculous – video poker is a close cousin to slot machines, nothing at all like head-to-head games of Razz or Omaha. While video poker games are among the safest bets in any casino (provided you know how to pick a good game), a world of difference exists between Jacks or Better video poker and traditional ring games and tournaments of Texas holdem and seven card stud. To clear up this misconception, here is a comparison of video poker to live head to head poker games. To start with, almost all video poker games (and all the ones found at Internet casinos) are based on the rules of a single poker variant, five-card draw. These games exist on video screens and look more like slot machines than anything else. The interface (touchscreens are popular in land-based casinos these days) is identical to slot play. 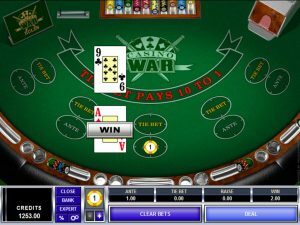 A standard game of video poker runs like this – the bettor lays a wager (the games allow small wager ranges and strict betting limits, unlike head-to-head poker games) and the screen displays five cards. The action begins when the player chooses one or more cards to discard and exchange for new ones. He can also choose not to discard any at all. A player’s payout is based on the value of their five card hand after the draw round. 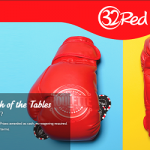 Winning combinations and pay outs are posted right on the machine virtual case. Some games of video poker are changing to match new technology available to Internet casinos; the biggest new addition to the games is the progressive jackpot. 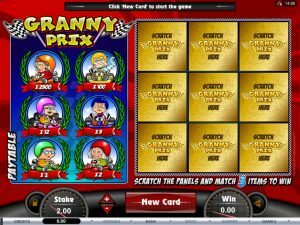 The idea comes from slots, the closest game to video poker in terms of rules and style of play. These constantly up-ticking prizes come from networks of games connected across hundreds of websites running the same software. The idea is to get bettors to place larger bets per hand, so the progressive may require an additional credit to become eligible for the progressive prize. 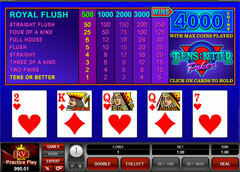 Play over 10 different variations of Video Poker such as Jacks or Better, All American & Deuces Wild. $60 FREE No Deposit Offer! Even though some versions of video poker offer good odds and the games are a ton of fun, they are nowhere near the same thing as actual Internet poker room play. Besides the way the two games are played, they are dissimilar because of the lack of real poker strategy required to play online Jacks or Better or Deuces Wild. Five-card draw is not a common variant in ring games or tourneys, either online or in land-based poker rooms – you may be one of the best head-to-head poker players in the world and you won’t necessarily be good at video poker games. Real poker strategy involves the psychological aspects of the game, betting strategies, reading your players and calculating pot odds. Video poker games pit you against, well, no one. No need to learn when it is best to hold a high kicker and a solid pair when you play video poker. It just won’t help. True head-to-head poker is essentially the same as a game you play at your buddy’s house or in a poker room at your favorite casino, except that it is played over an Internet connection. Different online poker networks behave a little differently – not only are the visual aspects of online head-to-head games different (some shoot for ultra-realistic images, others are like cartoons) but the lineup of variants available, blind sizes, and tournament schedules vary as well. Still, the games of poker they host are the same as what you’d play in a casino’s poker room. 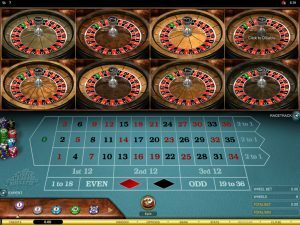 To add to the confusion, some Web-based casinos host both online poker and video poker games, though they are hosted in different areas of the site. Betfair Casino is a good example, a site that hosts traditional Omaha and Texas Holdem games in a poker room as well as classic video poker titles in their casino games section. You use the same bankroll stored in the same account to play both, but the customers drawn to the games are playing for very different reasons. Head-to-head poker is totally dissimilar to video poker; it is easy, however, to understand why some players may see similarities or confuse the two. In parts of the world, video poker games may be the only option to get your poker fix. In fact, until head-to-head Internet games become a recognized way to gamble (the US market is currently undergoing some drastic legal changes at the level of state law) and their players are given the same rights as players in land-based casino poker rooms, it isn’t surprising that the average Joe has no idea what separates online video poker games from real head-to-head poker contests. Put simple, online head-to-head poker is for legitimate poker gamblers that use strategy, pot odds calculations, deceptive tactics, and flop-reading skills to compete. Video poker is people who like casino machine games but don’t like the longer odds found on slot machines.